A strong arctic front will push through the Southeast beginning late tonight in the highest elevations of WNC. Moisture will flow into the valleys below shortly after, and that rain should switch to snow by daybreak. I believe a dusting to 2” will be possible for most locations around Western North Carolina, with higher totals along the NC/TN border. Roadways could become slick early tomorrow morning, so please use caution when traveling around the area. Some lee side redevelopment will occur as the front pushes across NC, and that will drop snow on some central and northerner NC counties as well. Below you can see my projected snowfall map. 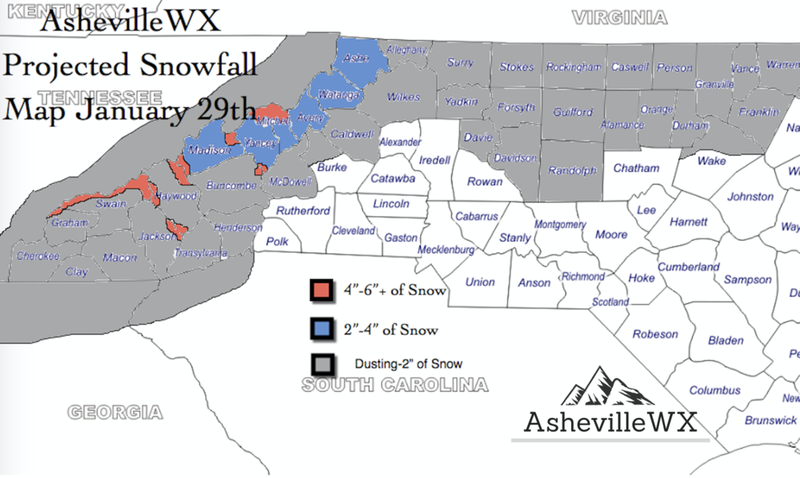 Join me live in the AshevilleWX App tonight at 8pm as I discuss how the storm will unfold, and what the most recent model updates show!